Jagwire is a state-of-the-art, comprehensive news and information resource produced by the Division of Communications and Marketing. 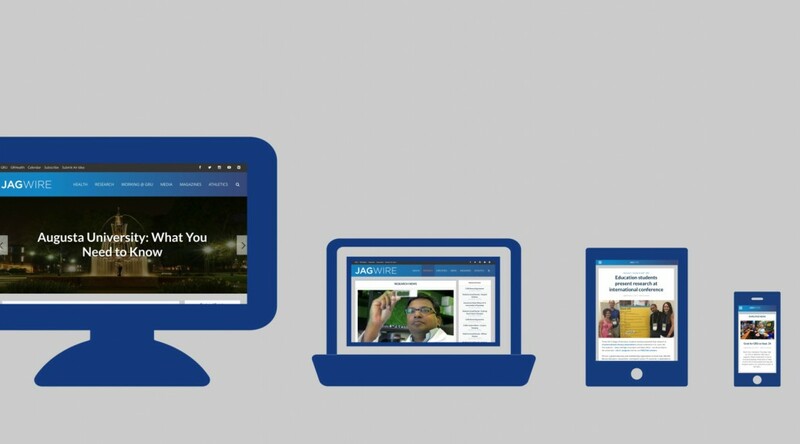 Developed in response to a growing demand for daily content from both the university and health system, Jagwire is your one-stop shop for everything news at Georgia Regents University, soon to be Augusta University. Want to know what’s new on our campuses? We’ve got you covered. What about the latest happenings from the world of health care? Not a problem. Events? Stories? Breaking news? Jagwire has it all. In addition, Jagwire also provides you with valuable employee resources, including the latest information on benefits and training opportunities as well as calendars tailored to your area of expertise. Ready to get started? Take a moment to view the simple instructional video below, or explore on your own by clicking anywhere on the blue Jagwire banner above. And before you go, take a second to bookmark our site on your desktop or mobile device or follow @AUG_JAGWIRE on Twitter. That way, you’ll always be able to find the news you want, when you want it. You spoke, and we listened. The future of workplace news is here. Join us on Oct. 1 in the JSAC Breezeway or Oct. 5 in Terrace Dining from 11:30 a.m. to 1:30 p.m. to learn how you can #GetWired with Jagwire!